SIDNEY – Fourteen students from Lehman Catholic High School participated in the Ohio Academy of Science Upper Miami Valley District Science Day on March 9 at Edison State Community College in Piqua. Students from Champaign, Darke, Miami and Shelby counties exhibited 118 projects in science, technology, engineering and mathematics. Twelve Lehman Catholic students received superior ratings, two students received excellent ratings, and several students received special awards and cash prizes. Two Lehman Catholic students received the highest superior rating of 40 points for their projects – junior Ann Deafenbaugh for Banana Peel Plastic and freshman Adith Joshua George for Hand Cranked Bactericidal Water Heater. The following students received a superior rating, earning at least 36 out of 40 points. Two Lehman Catholic students received an excellent rating for their projects – freshman Alexis Bollinger for The effect starch has on a liquid and junior Lauren McFarland for Nuts for Energy. Several Lehman Catholic students received special awards and cash prizes totaling more than $850. 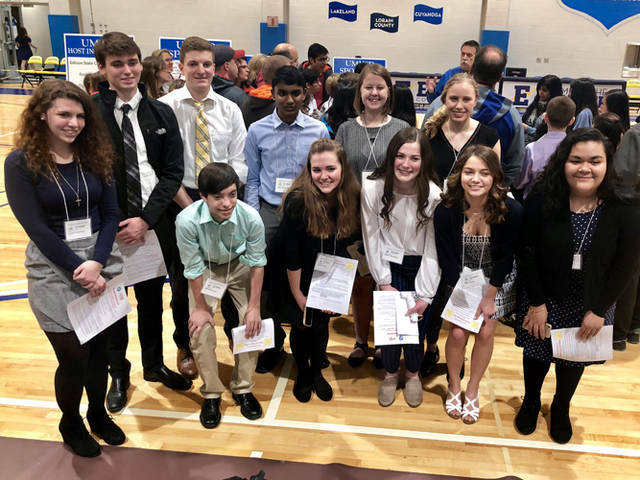 The 12 Lehman Catholic students who received a superior rating will compete at the State Science Day on May 11 at The Ohio State University in Columbus where more than $1 million in scholarships and special awards will be presented. Faculty of the Lehman Catholic Science Department who mentored the students in preparing for the event included Tracy Hall, Leah Bertke and Science Department Chair Sister Ginny Scherer.